White things always look clean and fresh, so why don’t you update your wardrobe with a fresh new look and add a little white necklace into the mix! White will go with pretty much anything and can look feminine and fun, without being too bold. A white necklace is a fabulous accessory for bringing out the color in your wardrobe and accentuating your perfect outfit. So, here are 10 white necklaces you have to check out, so you can grab hold of that summer vibe all year long! This fabulous white necklace from Jane Stone will brighten up any of your outfits and will add a stylish edge to almost anything in your wardrobe. It’s the ideal accessory for adding a summer vibe to your day. This white necklace features white rice shaped resin beads joined together to form a floral pattern in a gorgeous mosaic effect. The yellow gold tone chain adds extra detailing to the flowers on the necklace and gives it a trendy look. The chain measures 22 inches long and has a lobster claw clasp, so it’s a great length for a statement piece and it’s easy to secure. This bright white necklace is the ideal piece of jewelry for adding that extra glamorous touch to your outfit, especially when you’re heading out in the evening. 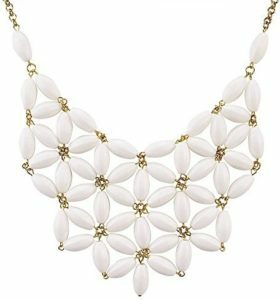 Its clean white color also makes it a great necklace for dressing up casual styles, as you can pair it with a bold colored tops or dresses to make the necklace really pop! Step out in style with this wonderfully chic white pearl necklace. If you’re looking to add elegance and grace to your day, then this is the necklace you’re going to need! 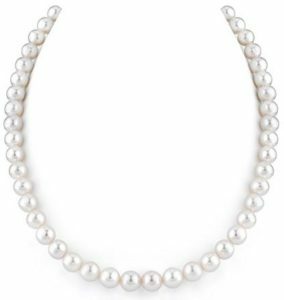 This beautiful necklace features 50 white freshwater cultured pearls, with each pearl measuring between 8 and 8 and a half millimeters, which is just the right size for an elegant pearl necklace. This silk string of pearls measures 18 inches in length, which is also known as the princess length, so just be ready for everyone thinking you’re a stylish member of royalty. With a clean white pearl necklace you can look ultra chic, and the best part is that it really does go with everything. You can wear it to brighten up a casual outfit; after all, it’s a natural product, so you can harness a look that’s naturally stylish. Plus, it will look fabulous with more formal styles in the evenings, or even as a gorgeous accessory for a wedding. This exquisite necklace would make an ideal gift for anyone who loves that effortless and classic look that will stand the test of time. Channel the laid back Hawaiian lifestyle with this white shell necklace from BlueRica. For all the surfers out there, this is the one accessory that you know you will always wear. 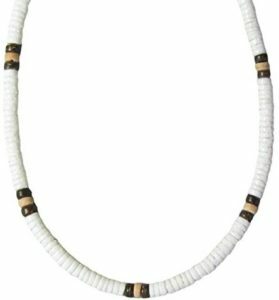 This beautiful necklace is made with white puka chip shells, strung together to create a stylish, trendy look that is perfect for jazzing up your casual styles. The necklace measures 18 inches in length and features a barrel clasp that screws on, so you can always be sure it’s secure on your neck, even when you’re out being adventurous! The white shells give this necklace a natural look, which makes it ideal for wearing everyday, and especially when you’re at the beach. This would be a fantastic gift for anyone who loves a laid back lifestyle and likes to imagine themselves lying on a sun-drenched beach somewhere in the South Pacific. 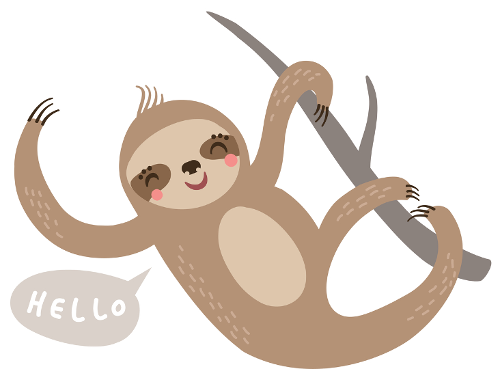 Maybe you quite fancy that lifestyle yourself? Well, this is the necklace you need to start setting sail! So you can show off your beach style everywhere you go! If you’re looking for that one accessory that you can wear everyday, that will go with all your casual styles as well as your personality, then this white necklace is the one for you. This stylish necklace will bring out your laid back vibes and add a bit of depth to your style. Featuring 5 millimeter white puka shells and genuine wood coco beads, this necklace delivers a casual look that will look perfect when you’re on the beach or chilling at the pool bar. It’s the ideal summer accessory that will keep the summer feeling going all year round. You can choose your own length for this necklace, so you can get whatever size you’re looking for, ranging from 7 inches to 24 inches! Each necklace is hand crafted and features a barrel clasp, that screws on and off, as well as sturdy and durable stainless steel wiring, so you can surf or skate without worrying about it coming off. This necklace would make a great accessory for anyone who loves the beach lifestyle and surfer styles. 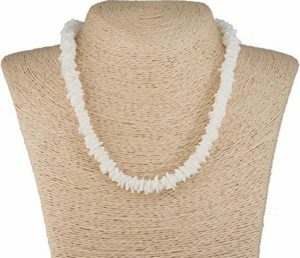 Men, women and kids will all love this tropical looking white necklace, and with the choice of lengths, you can get one for everyone! So, you need a necklace that’s going to look fabulous and add a little bit of elegant glamor to your world. Well, this stunning white necklace will do just that. This exquisite handmade necklace features a beautiful white floral pendant, which has been hand carved into the shape of a delicate camelia. 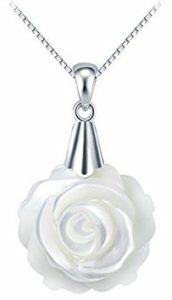 The dime sized white camelia will shimmer on your neck, and add a feminine feel to everything in your wardrobe. The pendant hangs from a rhodium plated sterling silver bail, giving the necklace extra radiance. The sterling silver chain is also rhodium plated and measures 18 inches in length, making it a fashionable length for wearing with a whole range of different outfits. This beautiful white camelia necklace is a fabulous piece for wearing everyday, and with its delicate, natural appearance, you can wear it to work or school, as well as out for a dinner date. It would also make a wonderful gift and comes ready to give in a pretty little gift box, decorated with ribbon. It even comes with a silver polishing cloth, so you can always make sure your necklace keeps its lustre! So, you’re looking for a choker necklace but you want something a little more fun and a little bit different. Well, this pretty little white choker could be just the thing! This white necklace features little fabric daisies sewn together for a daisy chain effect. The daisies are white with yellow in the center, so you get the look of a real daisy chain. The necklace measures 12 inches and has a little extender chain that can extend the length an extra 2 inches, so you can easily adjust the fit. This white necklace gives off the perfect summer vibe and would be the perfect accessory for a summer garden party or a summer wedding. 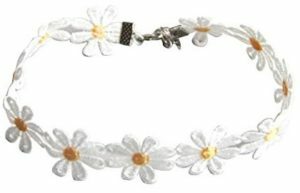 If you’re channeling the boho look, then this daisy choker would look fantastic! It has a laid back feel, but is stylish enough to wear to any event, to keep you true to your style and personality. And the fabric material means it will look delicate and dainty on your neck, keeping your outfit looking just as fresh as a daisy! Everyone needs to have a little fun now and then, and with this cute white necklace you’ll be able to show off your fabulously fun side all the time! Jazz up your wardrobe and add a little sparkle with this adorable little owl! This darling necklace has a retro vintage look, with the large white enamel owl set in an antique gold tone copper metal. The white owl pendant is just over an inch and a half in length and just over an inch wide, so it’s large enough for everyone to notice and comment on! 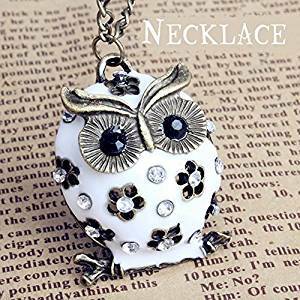 The owl features a black and white flower pattern all over his white body, with clear rhinestone crystals to give him a little extra glitz. He also has sparkling black crystal eyes with big eyebrows and little feet that stick out the sides! The antique gold tone copper chain is around 27 inches in length, so it will hang really low when it’s around your neck and the good thing is you can easily fit it on over your head! The pendant is hollow, giving a locket type appearance, which adds to its trendy, retro style. This is a fantastic necklace for adding a bit of glamor to your casual wardrobe and you know everyone will love this cute little owl with his big sparkly eyes! It would make a great gift for owl lovers everywhere! Now, this white necklace has it all! Elegance, sparkle and style, all wrapped up into one beautiful little necklace. This stunning necklace features a radiant white topaz stone, crafted into the shape of a heart and set in sterling silver and hanging from a creatively designed sterling silver bail. Above the white topaz heart, a little clear cubic zirconia crystal adds even more sparkle. The chain is sterling silver and measures 18 inches in length, letting you wear the necklace comfortably with lots of different outfits. 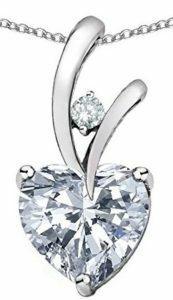 The pendant is small and delicate, being only three quarters of an inch long and the white topaz heart being just over a quarter of an inch in length. This small size makes this necklace a fantastic accessory for wearing everyday, as it’s dainty enough to look subtle on your neck, no matter where you go. So, you could wear it with your casual styles, as well as out to dinner! It’s just that versatile! It would make a stunning gift for a loved one and even comes beautifully packaged in a pretty little gift box. For anyone who loves luxury goods and fine jewelry, then this necklace is definitely for you! This brilliant white necklace delivers an elegant amount of bling that will keep you sparkling for years to come! 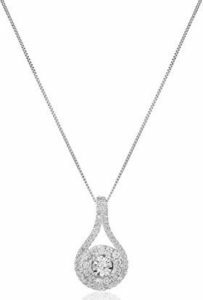 This gorgeous necklace features bright white diamond clusters, totalling a quarter carats, adorning a teardrop shaped pendant. The 57 diamonds are set in white gold, which adds to the luminosity of the necklace, and matches the white gold chain. The pendant is just over half an inch in length and just under half an inch in width, making it dainty enough for you to wear it anywhere you choose. The chain is a box chain, in white gold, measuring 18 inches in length, with a spring ring clasp. It’s the ideal length for wearing with most tops and dresses because of where it sits on your neck. If you’re looking for a glitzy gift for a special someone, then this necklace is ideal. Because of its diamond cluster design, it catches the light a lot better than some diamond solitaires, so you get even more sparkle from it. It comes with a lovely little gift box, so it’s ready to be the perfect present! If you’re looking for a versatile white necklace that doesn’t scrimp on style, then this stunning white pearl necklace could be just what you’re after. Not only does it have a timeless look, but it’s natural and chic! This pretty necklace features a single white freshwater cultured pearl on a sterling silver pendant. The beautiful round pearl measures 10 millimeters, so it’ll be noticeable on your neck and will attract all the best attention. The pearl is delicate enough to wear everyday, and with its natural white coloring it will go with anything in your wardrobe! The sterling silver chain is an 18 inch curb chain, which helps give the necklace a more shimmering look and makes it a great length for all your different outfit styles. It would be a fabulous necklace for wearing to work or school, and equally suitable for wearing to an elegant dinner or a stroll along the beach!